Hugh Thomas Munro was born in London, in 1856. He was the eldest of nine children, and the son of Sir Campbell Munro of Lindertis. The family was Scottish but divided their time between London and the family estate near Kirriemuir, about 20km north of Dundee, in the county of Forfarshire. The London connections led him to a business training in London. 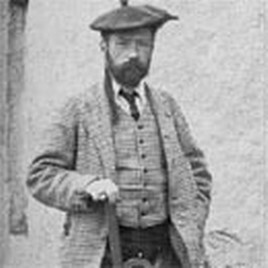 Munro was an original member of the Scottish Mountaineering Club, which was founded in Glasgow, in 1889. As a boy he was an avid collector; shells, fossils, eggs and so on. It was while on a trip to Stuttgart aged 17, to learn German, that he became attracted to the mountains. The two attractions; collecting and mountains, would later be productively fused. He lived in London in his parents' house in Eaton Place until a bad attack of pleurisy led to a recommended change of climate. He went to Natal, in South Africa, in 1880, as Private Secretary to Sir George Colley, the Governor of Natal. On the outbreak of the Basuto War he volunteered, joining an irregular cavalry outfit, Landrey's Horse. With them he stayed throughout the campaign, carrying dispatches through enemy territory. One of his sisters, writing after his death, describe matter of factly the souvenirs and curios he brought back with him to London from South Africa. These included Basuto and Zulu curios, antelope heads, a black boy, and a monkey. There is no indication anywhere as to the eventual history of the native boy. After his return from Natal, he entered politics for a while, standing once as the Conservative for Kirkcaldy Burghs, in 1885. He worked hard at organising the local political life in Forfarshire and also served on the County Council. His business training, it has been speculated, not to mention his energetic political work in various committees etc, gave him an organised approach to whatever he took on, an approach which paid off in 1891 when the sixth number of the Scottish Mountaineering Club Journal published his now famous "Tables of Heights over 3000 Feet." This was in September 1891, in Volume 1. Munro, in a note to his Tables, candidly confessed that "when first this work was commenced, I had little idea of the enormous amount of labour and research which it would entail." Munro was not a particularly athletic type; small and neat, rather than muscular, with very small feet. He was a keen and expert dancer, which came into good use during the London social seasons. Munro was 33 years old when he began his monumental task for the SMC, in December 1889. At that time he had personally visited only 42 tops. Fellow climbers were invaluable sources of knowledge, as of course were the O.S. one-inch and six-inch maps. He finished the list in the summer of 1891, with a total of 283 separate 3,000-foot mountains. While the original list contained anomalies which would later be corrected, it should also be recognised that given the conditions under which Munro worked it was a remarkably accurate list. Since 1889 there have been only four major revisions; in 1921, 1953, 1981, and 1997. The first major revision in 1921 and some two years after his death, was essentially Munro's own work, as he was unhappy with his original classification. One peculiarity of the 1889 list, for example, was the fact that on Skye, Munro had Sgurr Dearg as the mountain, and its adjacent and very obviously higher pinnacle (later to be named "The Inaccessible Pinnacle") as its top. This was almost certainly because the latter was not named by the Ordnance Survey. It only gained its name some time after the first ascent by the English climber Pilkington (who also did not provide a name). Munro married in 1892, to Selina Byrne, the daughter of a General. She was a Roman Catholic, which caused Munro to have a falling out with the local kirk. This led to Munro creating a private graveyard close by his home, in which his mother and wife, who both predeceased him, were buried. His wife died in 1902, by which time they had two daughters and a son. 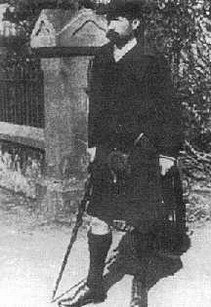 The latter, Sir Torquil Munro, now lives in the States and was two years of age when his father died. Munro, who was a King's Messenger, on occasions ferried valuable documents to various diplomats across the world. This allowed cheap travel, which Munro and his wife both enjoyed during their short time together. Ironically enough, Munro was fated not to climb all the Munros on his list. Having said that, from a strict point of view he had only one mountain left to do, the easy Carn Cloich-mhuilinn. He had in fact attempted the Inaccessible Pinnacle several times, as he was almost certainly intending to climb not only all the Munros but as a main target all the tops. Of the 538 tops he listed, he climbed 535. He became arthritic at a relatively early age; in 1893, when 37, he had to turn back from a walk due to this painful affliction. He had probably all but stopped going up hills by 1915. After all that work on the List, Munro was three tops short of compleation; Carn Cloich-mhuilinn, the Inaccessible Pinnacle, and Carn an Fhidleir. The last he had failed on during a night attempt in poor conditions. Carn Cloich-mhuilinn is no longer a Munro, having been demoted in a later revision. Then came the first of two World Wars. Anything which did not contribute to the war effort withered and died. Munro worked in Malta during the winter of 1915-16, tracing the missing. He was of course past military age. While there he caught some type of malarial fever and returned home for a while. In the spring of 1918 he went out to Tarascon with his two daughters and working with the French Red Cross set up his own canteen, serving troops returning from the war. In March 1919, he caught a chill which developed into pneumonia. In the pre-antibiotic days this was often fatal and after a week he died, in his small hotel room, on March 19th, at the age of 63. There was a funeral service in Tarascon, where the French paid homage to his charitable work but Munro's body was brought home and laid to rest in the small private burial ground in which Munro's mother and wife already lay. This was on the 2nd April, 1919, a short distance from the family home near Kirriemuir.